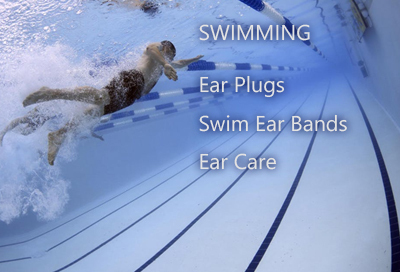 Swimming Ear Plugs Ear plugs that are created specifically for swimming; keep ears dry and prevent swimmer's ear. Moldable Ear Plugs These soft, multi-purpose plugs made of wax or silicone keep water out very comfortably. Tip: Add a swimming ear band to your child's moldable ear plugs for the best protection from water for kids with ear tubes. It is critical to keep water from getting into the inner ear which can lead to swimmers ear, surfers ear and general ear infections. For adults who use swimming or surfing earplugs frequently, professional lab custom swimming earplugs are highly recommended, because they last the longest and fit the best -- but of course these are also the most expensive. Moldable swim plugs are generally better for kids because these ear plugs are not inserted into the ear canal, which means these plugs will still fit as your kids grow. Water ear plugs for surfing and other cold water, high-wind water sports must be chosen carefully. Surfing ear plugs need to have a low NRR so you can hear what's going on around you, and they must fit very well to keep both cold water and wind out of the ear to prevent sufer's ear. Moldable silicone ear plugs are easy to use, extremely comfortable, and excellent for swimming, bathing, and generally keeping water out of your ears. Silicone ear plugs will never melt or over-soften in the heat. Also a very popular choice for sleeping, studying, and relaxing. Best for swim and water. Offering superior fit, comfort, and water protection, professional lab full custom molded ear plugs are the very best water protection ear plugs available. Custom swimming ear plugs are recommended for adults who swim, surf, or enjoy other water activities frequently. These custom swim plugs are also highly durable, and can last for years with proper care and cleaning.